Perlite is a substance that has many commercial and industrial uses. Also known as volcanic glass, perlite is used in agriculture, shipping, medicine and a host of other applications. Perlite is a volcanic rock mined in the United States, as well as other countries like China, Greece, and Italy. The volcanic glass, or perlite, is formed when lava (molten rock) spews out of a volcano, and cools in a rapid manner. Because of rapid cooling, water is trapped within the rock, and the lava forms into a glass-like structure. Perlite contains 2 to 5 percent water and is a silicate rock, meaning it contains a "high percentage of silica (Si)," according to the Mineral Information Institute. Perlite in its crude state bears little resemblance to the expanded product once it has been processed. 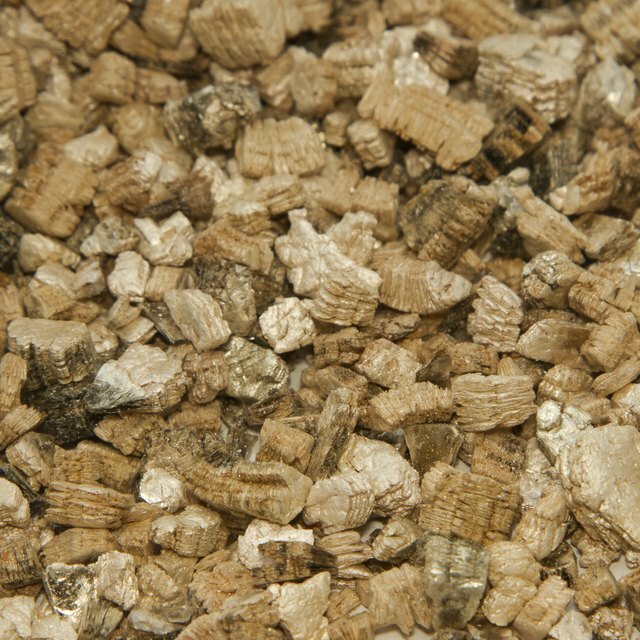 How is Perlite Mined & Manufactured? Readying perlite for marketing, the rocks undergo processing to make it usable. In California, at the American Perlite Company situated on the eastern side of the Sierra Nevada Mountains, the gathering of perlite is done through open-pit mining. The material is extracted with very large earth moving equipment. These perlite loads are then dumped into a tipple, a gravity feed machine that loads the rock into a crusher. Once the rocks complete this process, they undergo a second crushing and then separation into different grades depending on use. The expanded form of perlite comes from the rock being heated to a temperature of 1,600 degrees. The graded rocks are gravity fed into a tall furnace, where they are dropped down toward the heat source. At the right temperature, they pop like popcorn, and turn white, expanding from four to 20 times their original size. A person controlling the furnace can adjust the air flow and temperature, which relates to the density of the product, according to the American Perlite Company. Perlite that has been expanded is extremely light and able to absorb many times its weight in water. Perlite has many applications. The Mineral Information Institute says the bulk of perlite is used in the construction industry as roof insulation, refractory bricks, pipe insulation and filling masonry blocks. This material is an ideal construction product because it is non-combustible, an excellent insulator from the environment and a noise insulator. The American Perlite Company says the product is also used in horticulture and industrial applications. Most people are familiar with this product if they ever used potting soils before. 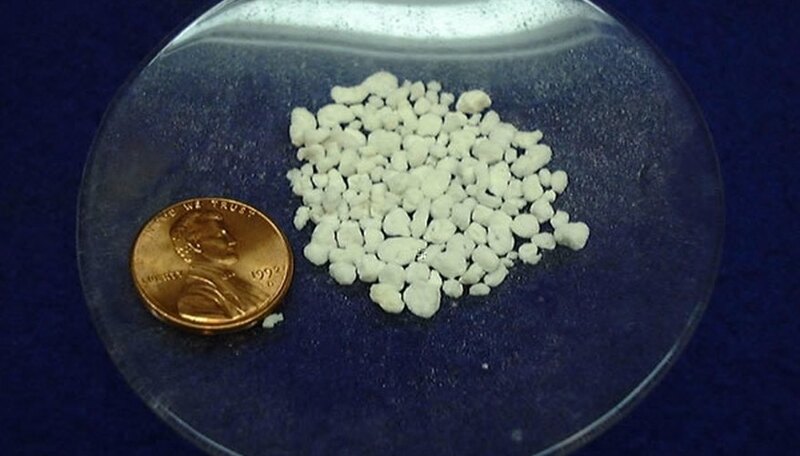 Perlite forms the white rocks found in high-quality potting soil mixtures. In industrial applications, perlite is used in the pharmaceutical industry, food production and water treatment as a filter. It is also found in soaps as an abrasive. According to perlite.org, perlite has been used for more than 50 years, showing that the substance does not pose any health concerns. Studies done between 1975 and 1994 showed perlite did not cause any noteworthy respiratory health problems to workers. But because of the dust particles that arise from the manufacture of perlite, some workers experienced "physical irritation, discomfort, impaired visibility and enhancement of accidental potential," according to the Perlite Institute. There has been growing concern that perlite may be contaminated with asbestos, making perlite a dangerous product. According to the Perlite Institute, and their continuing tests, the answer is no. The two substances are rarely found together in volcanic rock, according to a 2002 report. David, Michael. "What Is Perlite?" Sciencing, https://sciencing.com/perlite-5402928.html. 24 April 2017.